Persuade Lagoon Amusement Park to close down its "Zoo"
When you go on Lagoon Amusement Park's Wild Kingdom train ride in Farmington, Utah, you see all sorts of amazing animals including Siberian tigers, lions, and zebras. They're amazing to see but, for the animals, it's a very different story. The animals that live in the "zoo", that are on public display at Lagoon, have a very sad life. Ranging from tigers to wildebeest, lions, jaguars, zebra, miniature donkeys and sadly, so much more, are kept in small dirt, concrete, and wire cages with very limited space and no enrichment whatsoever. There is also no grass in any of the cages so they probably have never put their feet on anything soft in their life. For anyone who has been to Lagoon, have you ever noticed the animals just lying down and doing nothing all day? Do you think those animals are being treated with respect as they deserve to be? I don't think so. Some of these cages are also next to very loud rides which can be very stressful. These animals do not belong in an amusement park! Lagoon is meant for people and the animals are just a sideshow for people to gawk at. There is no reason why exotic and domestic animals should live there. The U.S. Department of Agriculture (USDA) and the Animal Welfare Act (AWA) have inspected Lagoon many times and have charged the park with serious violations including no veterinary care for sick and dying animals, filthy enclosures, untrained zookeepers, failure to provide the animals with enough space to roam and more. In 2013, a zookeeper was gored by a wildebeest in the leg, this shows how little human interaction these animals have had and how dangerous they can be. These animals have also been seen to show signs of stress. If you go to YouTube and find videos of rides on the train ride, a few of them will show tigers, lions, and other animals pacing endlessly inside their enclosures. These animals are clearly not happy, despite the lies Lagoon tells us. 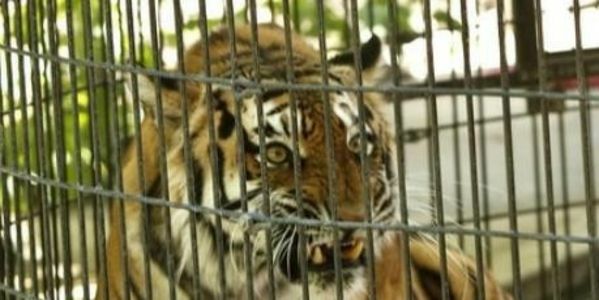 Please help me and other caring people to persuade Lagoon and Farmington's City Council to shut down the "Wild Kingdom Zoo", find a better purpose for the train ride and, most importantly, relocate the animals to a better zoo or animal sanctuary. Lagoon did not build the Wild Kingdom zoo to preserve endangered species; they built it to please and entertain paying guests. Please help all those animals that did not have a chance to be free and happy. Utah Animal Rights Coalition (UARC) is putting together a demonstration on March 31st from 11am-1pm to protest against Lagoon's opening day. Please join them if you are interested! More details are on their home page on Facebook, www.facebook.com/utahanimalrights. Look for the post, "Protest Lagoon's Opening Day!" Please also tell your friends and family about this petition and ask them to sign it!